Attach a stirrup (handle) to a low cable pulley. Grasp the stirrup with both hands. You can either interlace your fingers or place one hand over the other. Step back so that the cable is pulled taut. Turn your lower body until your feet are facing away from the pulley, and position your feet so that they are staggered. Keeping your arms straight and shoulders locked in place, exhale as you rotate your torso and pull the stirrup in a diagonally upward motion until your torso faces away from the pulley and your hands are raised above your head. Inhale as you reverse the movement and return to the starting position, with your lower body still facing away from the pulley. Keep your lower body facing away from the pulley, your arms straight and your shoulders locked in place. This will ensure that most of the movement comes from the rotation of your torso/spine. Try to reduce the amount of rotation that occurs in your hips. Keep the movement under control. Use the cable down-up twist to strengthen and stabilize your core, and to strengthen the rotational movement pattern of your torso. It’s a good idea to stop and hold the stirrup for a few seconds halfway through some reps. This will help to improve your torso’s ability to resist rotational forces. Ensure the cable is taut throughout the movement. See also the cable wood chop and the seated cable twist. Unfortunately, I couldn’t find any decent video demonstrations of the cable down-up twist. In the video below, you will learn how NOT to do the exercise. Notice that he is not keeping his lower body facing away from the pulley. He’s also not keeping his arms straight and his shoulders locked in place. There is therefore minimal rotational movement in his torso. As a result, instead of working his obliques, he is mainly working his shoulders. Such a useful site! 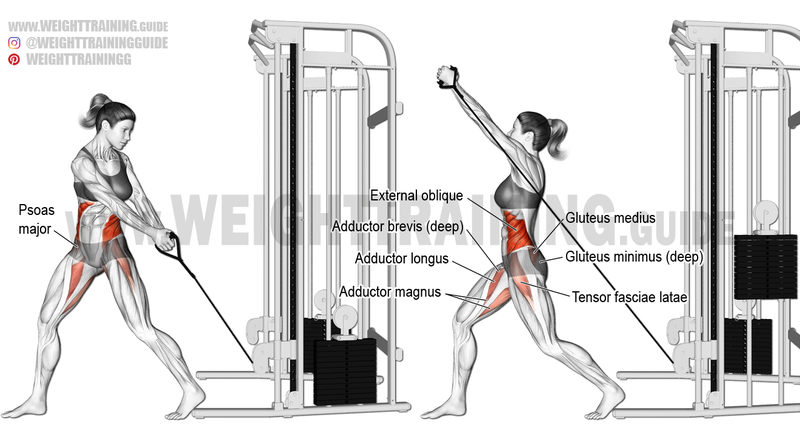 Loving your exercise diagrams. Very helpful to me. A great descriptions!! !